Home > Heavy Duty V Belts > Poly-V Ribbed (Micro -V) Belts > J, PJ Section Poly-V (Micro V) Belts - 3/32" Rib Width. > 460J7 Poly-V Belt. Metric 7-PJ1168 Drive Belt. > 460J16 Poly V (Micro-V) Belts: J Section. Metric Belt PJ1168. 16 Ribs. 460J16 Poly V (Micro-V) Belts: J Section. Metric Belt PJ1168. 16 Ribs. 46 inch Length, The number following the 'J' designates the number of Ribs. (Measurement shown is for Outside Circumference.) Our biggest seller for multiple applications. These V-ribbed belts are designed to replace OEM belts on extra heavy-duty applications. 460J-12 Poly-V Belt, Metric 12-PJ1168. 46� Length. PJ1168/460J 12-Rib Motor Belt replaces fitness belts, compressor belts, drive belts, and electric motor belts. 460J-12 Micro-V Belt. 460J20 Poly-V belt. Industrial Grade. 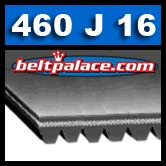 46� Length PJ1168/460J 20-rib belt replaces fitness belts, compressor belts, drive belts, and electric motor belts. 460J-20 Micro-V Belt.